The Indiana Racing Memorial Association (IRMA), a new not-for-profit group organized to place markers throughout the state to recognize Indiana’s significant role in motorsports history, will hold its first fundraiser Saturday, Oct. 25 from 5 p.m. to 10 p.m. at the Hall of Fame Museum located on the grounds of the Indianapolis Motor Speedway. The Indianapolis Motor Speedway had the only marker to commemorate Indiana’s rich motorsports history when IMRA was formed last December. The group raised funds to install a marker at Winchester Speedway in Winchester, Ind., in honor of that track’s 100th anniversary in July, and wants to install at least 18 more by the state’s bicentennial in 2016 to recognize the significant contributions Indiana citizens, events, businesses and race tracks have played in the history of motorsports. 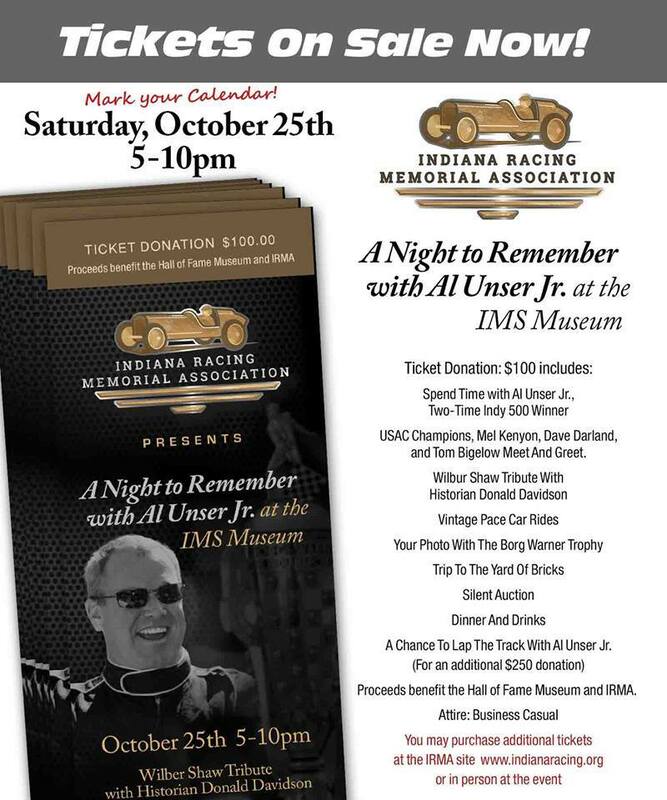 Al Unser Jr., a two-time Indianapolis 500 winner, will be on hand to meet attendees at the “Night to Remember” fundraiser Oct. 25, as will USAC champions Tom Bigelow, Dave Darland and Mel Kenyon. Historian Donald Davidson will give a brief tribute to the late Wilbur Shaw, who will be honored with IRMA’s second marker on Nov. 1 at the Shelby County Fairgrounds in Shelbyville, Ind. Rides in a vintage pace car, photos with the Borg-Warner Trophy, a trip to the famous yard of bricks, a silent auction featuring racing memorabilia and outstanding pieces of automotive art, and the chance to mingle with others interested in preserving Indiana’s rich motorsports history amid the museum’s extensive collection will be part of the festivities. Hors d’oeuvres and beer, wine and soda are included, and mixed drinks will be available for an additional cost. The attire is business casual. The cost of admission is a donation of $100, which can be made through IRMA’s Web site at IndianaRacing.org or at the museum’s ticket office. The tickets will be the donors’ receipts. All proceeds will benefit IRMA and the Hall of Fame Museum equally. Unser has agreed to personally give a limited number of vintage pace car rides to the attendees who contribute an additional $250. Admission to the fundraiser also includes one year’s membership in IRMA, which costs $25 annually. Fans who aren’t able to attend the fundraiser may still make a donation in any amount or join IRMA through the organization’s Web site at IndianaRacing.org. All major credit cards and PayPal are accepted. Additional information about IRMA is available on the group’s Facebook page.